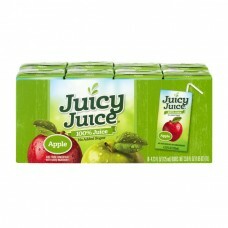 Juicy Juice® 100% Juice Boxes Apple. Juice from concentrate with added ingredients. 8-4.23 fl oz (125 ml) boxes. Net wt 33.8 fl oz (1.05 qt) (1L). Contains 100% juice. All juices may look the same but it's what's inside that matters. No added sugar. No high fructose corn syrup. No artificial sweeteners. Our delicious sweetness comes straight from the fruit, that's it! This product is pasteurized. Not a reduced calorie food. See nutrition. Facts for sugar and calorie content. Goodness made Juicy™. Juicy Juice and Goodness. Tetra Pak®. Tetra Brik® aseptic. Made Juicy are trademarks of Harvest Hill Beverage Company. Visit us at juicyjuice.com. ©2015 Harvest Hill Beverage Company. All rights resaved. Shake well before opening. Refrigerate unused portion and use within 48 hours. Do not drink if box is leaking or damaged. For best quality, use by date stamped on juice boxes.